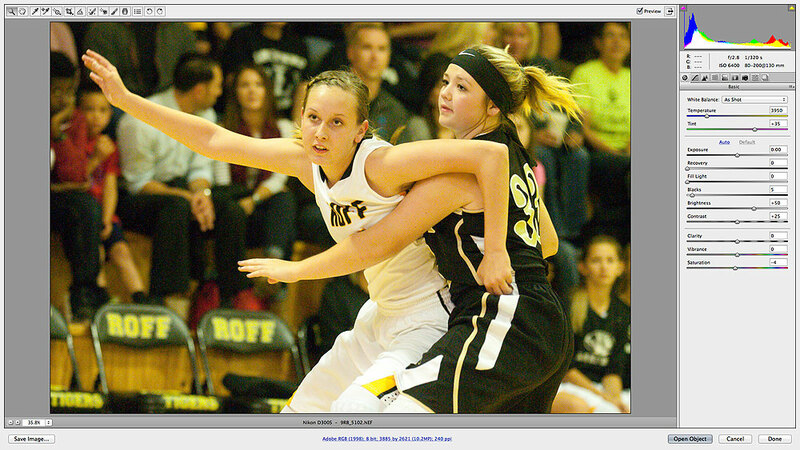 This is how my images looked straight out of the camera at a Roff Tigers basketball game recently. As you can see, they are contaminated with a ton of yellow-green light that is hard to dial out. I am in the middle of teaching another Digital Photography for Beginners class at the Pontotoc Technology Center. It’s a good group. As my readers and students know, I am an advocate of the RAW file format. I feel that while JPEG is a robust and easy to use format, it can, in many situations, cheat us out of the imaging potential of our expensive, sophisticated camera. JPEG, Joint Photographic Experts Group, is a a lossy compression file format that almost every computer in the world can read. It is the default file format for nearly every new camera. It makes files with 8-bits of data per color per pixel, meaning each color is expressed by a number from 0 to 255. Additionally, too much JPEG compression can create JPEG artifacts, which can’t be easily fixed or removed. RAW is a proprietary file type unique to each digital camera, that requires special software to access. It is a lossless, sometimes losslessly compressed, file format that creates up to 16-bits per color per pixel, meaning that each color is expressed by a number from 0 to 65535 or higher. Since RAW files don’t use the lossy compression that JPEGs use, it does not create compression artifacts. 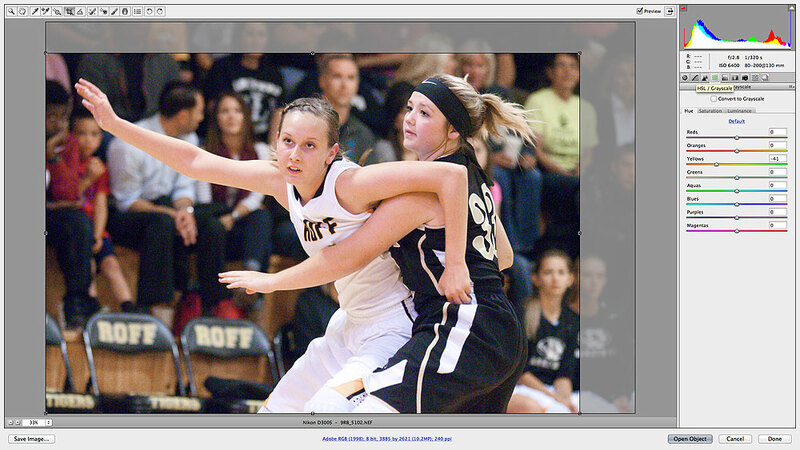 One situation where shooting RAW is indispensable is sports in low light, particularly in weird low light. I was in that situation last week in Roff, Oklahoma, a small high school with a cozy gym that is always packed with fans. With lights that have a yellow-green spike, and yellow floor, chairs, uniforms and fan clothing, the yellow quickly overwhelms any effort to pick a correct in-camera white balance. The only solution I’ve found is to shoot RAW, then aggressively dial out the yellow-green in Adobe’s Camera RAW dialog. There’s just not enough color data in an 8-bit JPEG to accomplish this. Human at last: after using the eyedropper tool to set basic white balance, I then dug into the hue and saturation dialog and aggressively dialed down the yellow. RAW to the rescue. Great info. I run into this all the time, but I shoot in RAW almost exclusively. Like you, I run into bad lighting situations constantly, especially at school facilities, and rely on RAW and Adobe to help me out. Thanks. Concise and clear. Well done. Today, every file from my DSLR is created in Canon’s raw format (.cr2), and processed to .jpg via Canon’s software — comes free with each DSLR purchase. I can only think of a few cases that my color was so messed up I couldn’t fix it, and those are more likely due to my own shortcomings, rather than that of the software. I highly recommend it to anyone using a DSLR — and some other cameras can record in raw as well. Last computer I bought was a high end “gaming” computer. Don’t play games (anymore) but wanted the speed for managing and editing RAW images. Everything gets dumped to an SSD drive for post processing and the gets archived to two different terrabyte portable hard drives. We’ve come a long ways from the Sony Mavica 640×480 format!